When we were in Florida last month, I had my camera equipment with me. I had great plans to walk on the beach and take pictures of the whales, the Navy seals maneuvers, the stars, the beach, and just about anything and everything unique to the St Augustine area. Well, the way things went down, I spent a lot of time painting and furniture shopping. I never did get to the beach, and as far as wildlife went – I drove through the preserve once and never got out of the car. In the 19th and early part of the 20th century, some of the world’s egret species were endangered by relentless plume hunting, since hat makers in Europe and the United States demanded large numbers of egret plumes, leading to breeding birds being killed in many places around the world. 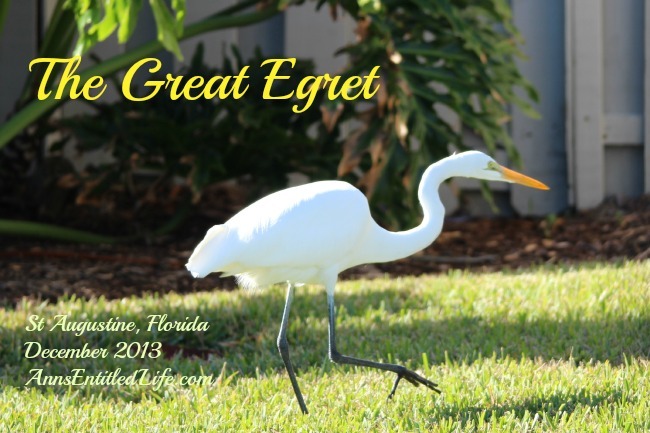 Several Egretta species, including the Eastern Reef Egret, the Reddish Egret and the Western Reef Egret have two distinct colours, one of which is entirely white. Little Blue Heron has all-white juvenile plumage. Slightly smaller and more svelte than a Great Blue Heron, these are still large birds with impressive wingspans. They hunt in classic heron fashion, standing immobile or wading through wetlands to capture fish with a deadly jab of their yellow bill. My sincere hope is I can photograph more birds and wildlife in the future for you, both in Florida, and in New York State.